People are fond of splitting the US up into those maps that show that the East and West coats think one thing but the mid-west and centre think the opposite. Democrat voters on the coasts, Republicans in the middle, latte drinkers on the coast, ole Joe’s home-brewed moonshine in the middle. Frequency of UFO visits, belief in gay marriage are other issues on which a marked difference in opinion can be seen. You get the gist, America can be divided up pretty easily. 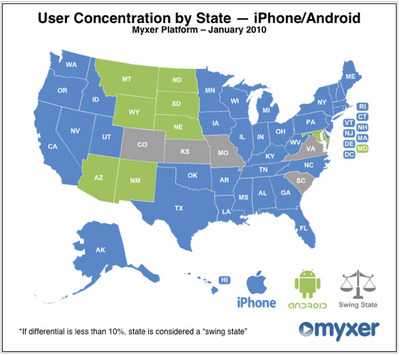 Anyway there is now a new way to split up the States and make a nice map at the same time and that is by the penetration of differently branded smartphone Operating Systems: Android vs iPhone. Android had been edging into the iPhone’s supremacy, and though Apple’s handset is more popular overall, Android phones have overtaken iPhones in several key states. I don’t really know why but it does seem to be a middle-America vs the coasts split once again. Is this because the iPhone has a poncey coastal liberal look to it? It’s for hipsters and smooth-talking city creatives not the more traditional central states? A stereotype definitely encouraged by ads like this Motorola Droid one. Okay the Android/iPhone divide is not completely identical to the traditional centre/coast split, iPhones are more popular than Androids in Texas for example and there ain’t nothing poncey about Texas. I’d like to see a map of Blackberry ownership as well. Probably superimposed on a map of UFO sightings.